The school cafeteria is a great place for children to get a healthy meal, while parents do not have to worry about sending their kids with a packed lunch. Parents just need to make sure that their children have money for their lunch. The problem is that many kids don't want to eat the lunch being served by the school cafeteria. This is a problem that can be easily rectified and does not have to involve feeding children junk food at their lunch meal. Not every child likes to eat the same thing as their friend, but there are general foods that almost every child in the school can agree upon. To discover what these foods are, you can either ask the children directly or have them fill out a survey, tailored to their particular age, in order to find out what they would like to have offered in their student cafeteria. While you will not be able to fulfill every request, this type of feedback will give you some ideas for what foods you can add to the menu. By trying to add as many food items as you can, you will be able to increase the number of children buying lunch in the school cafeteria. One of the biggest complaints that children have is that they are locked into one item for their lunch. This is something that can be solved by offering more choices. Rather than having one entrée, you can offer a few different entrees. You can offer some favorites along with a daily special. For example, you can serve spaghetti and grilled chicken every day, but offer things like pizza and hot dogs as daily specials on a rotation basis. Along with entrées, offer more choices for side dishes. Let children choose between things like vegetables, soups or starches. The more choices you offer the children, the more they will be encouraged to ask their parents for lunch money, rather than bringing lunch with them. One of the things that has worked well for school cafeterias for children in middle and high schools is a salad bar. Simple items like lettuce, cucumbers, tomatoes along with a few toppings, makes it possible for kids to get something healthy to eat, while giving them more incentive to purchase the lunch offered at the cafeteria. 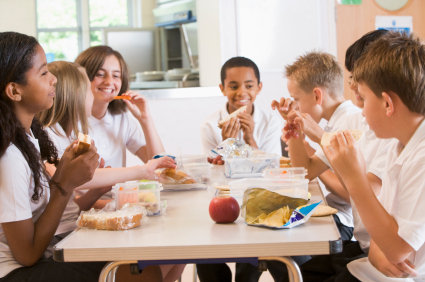 One of the things that may prevent school cafeterias from implementing a plan that provides more options to their students is that there will be more leftovers. This is a fair concern, but it can be overcome with some extra planning. Use ingredients that can be used more than once, or that can be made into something else,Today’s hot dogs can be tomorrow’s beans and weenies. You can also minimizing leftovers by utilizing the offer versus serve program, where children choose the items they want rather than being served an entire meal. This has proven to reduce leftovers as children generally eat what they have chosen. Also, preparing foods in relatively small amounts has also proven to reduce the problem of leftovers. Waste can be reduced by exercising proper food heating techniques and proper food storage methods, Using a steam table set at 140 will maintain the proper temperature to keep food warm and to avoid spoilage. Storing the food afterwards in proper food storage containers that are well marked with dates and times can help kitchen staff keep abreast of which items need to be used and when. Also, vacuum packaging food items bought in bulk can help save waste from spoiled foods and ingredients. Make sure that you advertise any changes you make to the student cafeteria. Distribute upcoming menus to students and their parents, that highlight new and exciting menu offerings. By letting children know that you have listened o their suggestions and that you are delivering, they (and their parents), will be encouraged to use the school cafeteria.